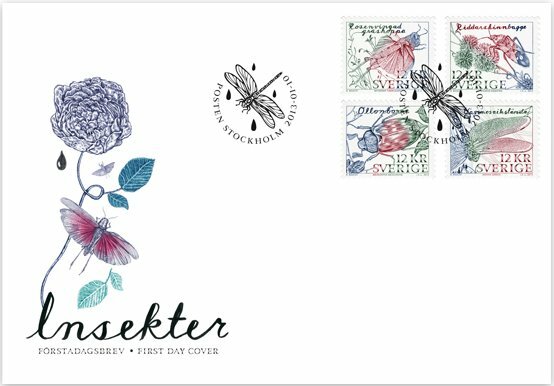 The stamp is one of the four designs insects issue. The cockchafer (Melolontha melolontha) is found in southern Sweden and is the official insect of the province of Halland. The stamp depicts the cockchafer in foliage. The Harlequin bug (Lygaeus equestris) is the official insect of the province of Gotland. The drawing is reminiscent of a knight's cross. Here the insect is sitting on a globe thistle. The pink-winged grasshopper (Bryodema tuberculata) is depicted on the stamp with lichen where it is found in Sweden, in the bare limestone soil on the island of Oland. This grasshopper is the official insect of the province of Oland. The Baltic Hawker (Aeshna osiliensis) is the official insect of the province of Narke. It thrives in shallow lakes with abundant vegetation. 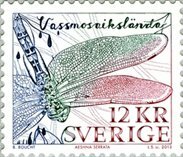 The stamp depicts the dragonfly and reeds.